An Assistant Product Manager under the supervision of the Product Manager helps in developing the company products. 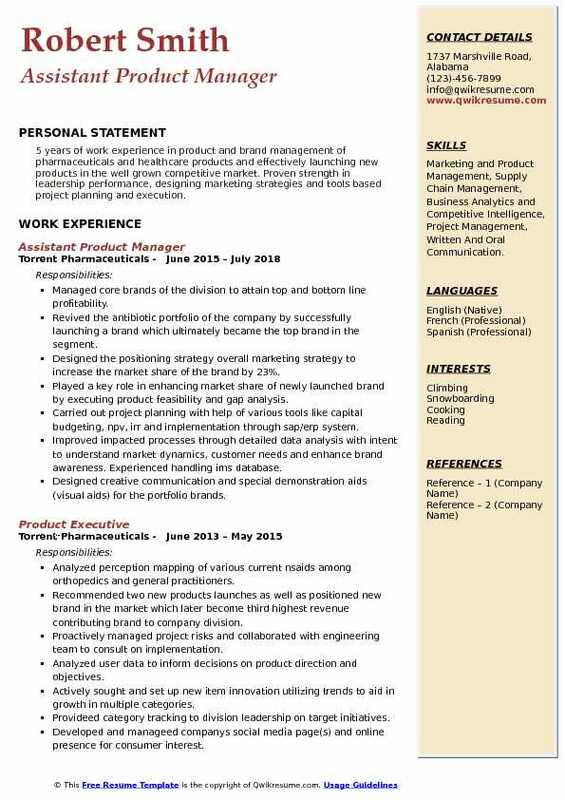 A well-written Assistant Product Manager Resume emphasizes on some of the core job duties such as – developing promotion strategies, developing and implementing techniques to ensure product stability, managing overall budgeting of a particular project, monitoring competitors, collecting data, supervising the marketing and production department and identifying potential areas for the old and new products of the company. 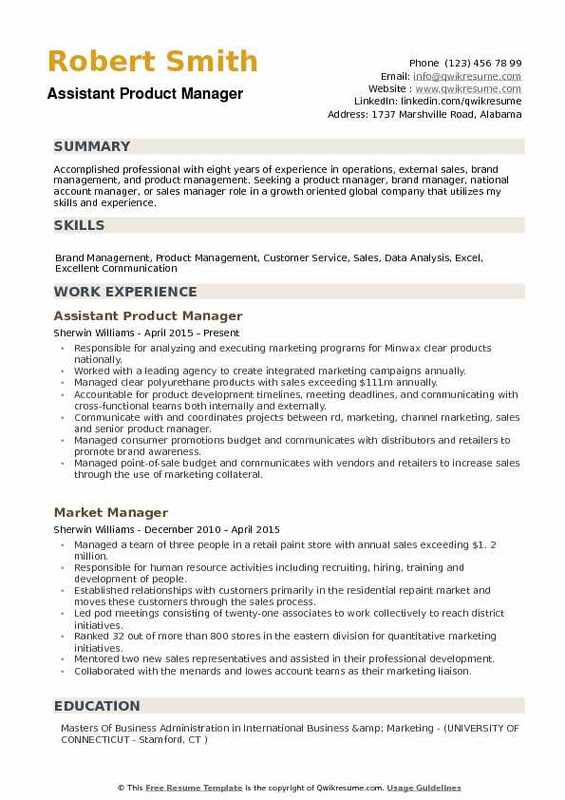 To flourish in this career path, Assistant Product Managers are expected to mention in the resume skills such as – aggressive skill to edge competition, negotiation and presentation skills, technical expertise, analytical thinking, and computer competencies. Most of the Assistant product managers embrace a Degree in the field of marketing, finance or business administration. Headline : Accomplished Assistant Product Manager with over eight years of Product marketing and training experience in the telecommunication industry. Efficient in project planning, customer support, and usage of CRM systems. Responsible for the tactical direction of the 3g business and to deliver value to the customer and growth in revenue and profitability to the business. Launched innovative Talktime and Data plans which led to the increase in percentage contribution of data revenue to total business gross revenue from 10% to 20%. My accomplishments while working with this business include establishing a well-based clientele ad inviting our lost customers back to our business with new promotions that fit their needs. Tracked all division spending and presented financial information to senior management on a quarterly basis. Performed market analysis by strategizing and identifying the proper market niche for growth, review competitive comparison on a monthly basis and studied customer feedback for future quality assurance purposes. Maintained strong relationships with vendor partners and became the point person for all communication. Worked with the agile development team to ensure efficient activity and time management – based on the changing demands of the customers and competition instead of working on a predetermined schedule. Headline : Assistant Product Manager with 6 years of experience in Pharmaceuticals. Looking for an opportunity that helps me to diversify and enrich my experience with new responsibilities in brand management primarily, but also open to other domains that complement my skills. 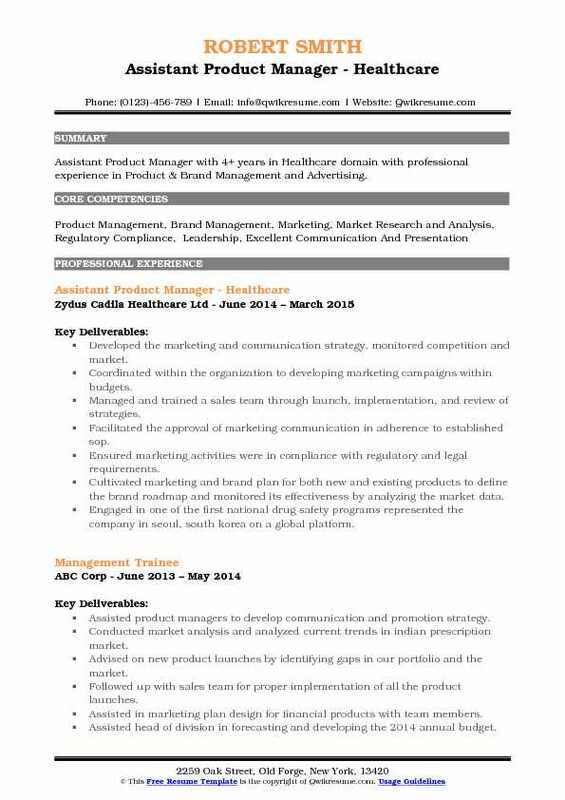 5+ yrs experience in pharmaceutical brand management marketing. Accountable for complete brand lifecycle management including new product launch. Developing brand plans for new existing brands: situation analysis - market, customer, competitor, internal; identification of future prospects. Customer segmentation/profiling, targeting budgeting, building brand communication. Develop and maintain best practices for marketing activities- from conceptualization to field level. Organizing and conducting sales promotion meetings on a quarterly basis for knowledge transfer to the sales team about the divisional and brand level strategies. Led a diverse cross-functional team in reviewing and approving all marketing materials, including legal and regulatory reviewers, ensuring brand messaging was consistent with FDA guidelines. Managed the marketing direction for all generic products, new product launches, identifying new products for development and evaluating monthly market share reports. Summary : Over 15 years experience in Service, Sales, Logistics, supply chain, Product management and key accounts handling in leading companies. I have been extensively involved in all functions and possess strong analytical skills, which have been straitened by analysis, negotiation, problem solving and the ability to make well thought out decisions. Skills : Business Operation. Authorization, Project Management, Risk Analysis & Compliance, Overseas Assignment, Time Management & People Management, Supply chain management Training & Development, Communicating with multiple cultures. To meet with dealers/sales staff to take their feedback and suggesting measures to management for increasing sales. To take feedback from the market regarding competitors activities (prices etc) prepare and analyze reports and provide it to top management. To evaluate the sales trend and make monthly sales projection for key business decisions. Monitor/sales promotion for key accounts national level. (carrefour/union coop/ lulu outlets). Handled key accounts export customers regarding yearly plans/arrangement and monitoring of shipment in correspondence with factories regarding production/quality and spare parts requirements. To coordinate with factory and set production priorities as per sales requirement. To manage the distribution of the product as national level i.e. From factory to branch warehouse. At same time coordination with the central warehouse to maintain the positive stock position of the product on all branches. 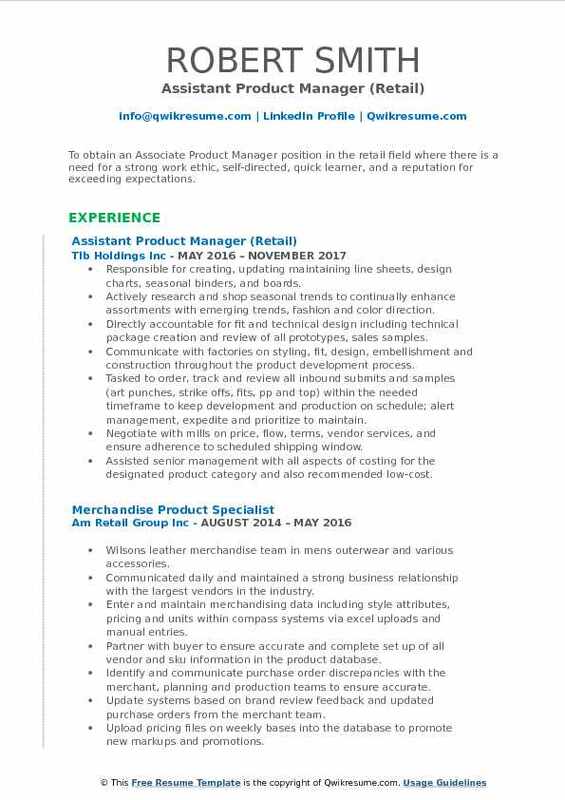 Summary : To obtain an Associate Product Manager position in the retail field where there is a need for a strong work ethic, self-directed, quick learner, and a reputation for exceeding expectations. 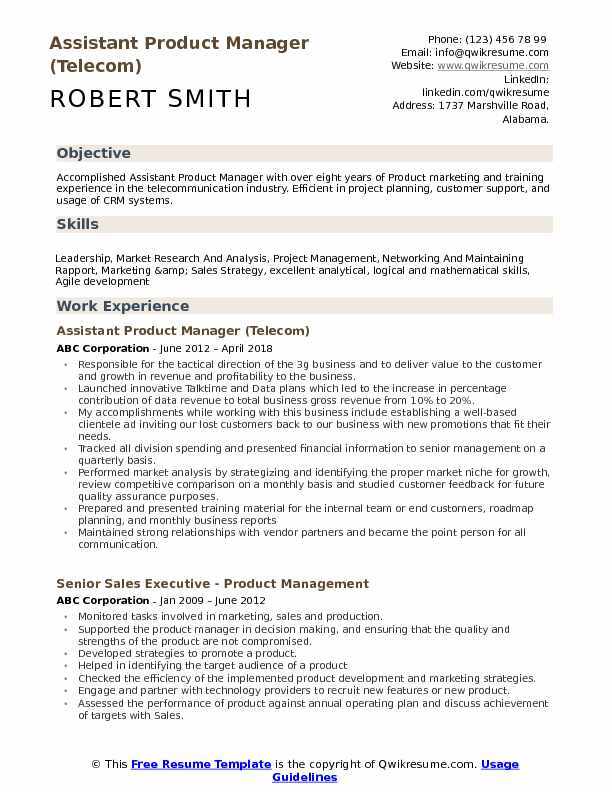 Skills : Market Research And Analysis, RETAIL, RETAIL MARKETING, DETAIL-ORIENTED, Strong Knowledge Of Retail Math And Daily Operations, Proficient With MS Office Suite Products, Strong Written And Oral Communication, Organizational, And Interpersonal . Responsible for creating, updating maintaining line sheets, design charts, seasonal binders, and boards. Actively research and shop seasonal trends to continually enhance assortments with emerging trends, fashion and color direction. Directly accountable for fit and technical design including technical package creation and review of all prototypes, sales samples. Communicate with factories on styling, fit, design, embellishment and construction throughout the product development process. Tasked to order, track and review all inbound submits and samples (art punches, strike offs, fits, pp and top) within the needed timeframe to keep development and production on schedule; alert management, expedite and prioritize to maintain. Negotiate with mills on price, flow, terms, vendor services, and ensure adherence to scheduled shipping window. Assisted senior management with all aspects of costing for the designated product category and also recommended low-cost. Responsible for all product testing requirements, compliance, internal standards and specific customers. Developed a comprehensive understanding of the time action calendars to monitor seasonal progress and ensure that. Communicate with the production team regarding any potential issues that might affect timelines and quality. Calculated and secured yardage for all required samples (proto, market, sales and design) and track delivery to the factory. Assist with the documentation, validation and reporting of liabilities, excess fabric disposal and sampling charge. Headline : Professional with 3 years of customer service and 2 years project management and marketing experience. Passionate about using creativity and problem solving skills to increase company profitability and promote growth. Excels at taking initiative and managing a team to achieve project deadlines. Works well under pressure and exceeds company goals and expectations. Developed product labels, sell sheets, item specifications and customer presentations. Assisted in the coordination of industry trade show events (iddba) from preparation to execution, while maintaining event budget. Responsible for identifying industry trends, events, packaging options, labeling requirements and consumer research to define new product category opportunities. Maintained content on social media platforms, while tracking and analyzing growth. Researched new, innovative product ideas and strategies to drive brand growth by developing consumer promotional buys, point of sale material and merchandising alternatives. Organized and participated in community events in order to promote the company. Served as the company's point of contact responsible for completing vendor item portals. Monitored and communicated project related variances that arose during product implementation stages to ensure customer goals and deadlines were met. Actively led and participated in cross-functional teams through the planning, execution, and analysis of new brand commercialization and extension goals. 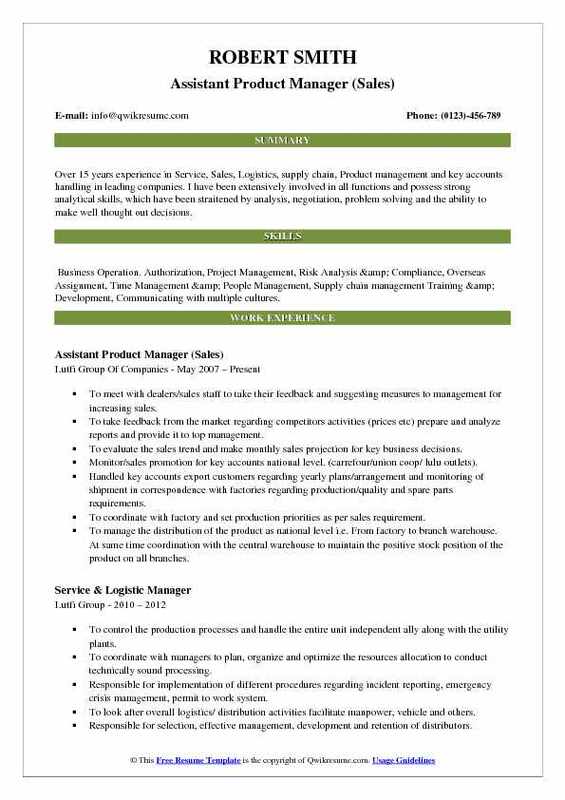 Summary : Assistant product manager responsible for daily sourcing operations and execution. Working closely with merchandising and our overseas manufacturers on all product details from conception to final delivery. I have worked in various rolls in the retail industry for the past nine years. Sourcing and placement of products in dressy blouses, dresses, and coats in j/m and plus divisions. Building partner relationships with an overseas agent and direct vendors to confirm development objectives are achieved. Managing product development process from concept to adoption of the final product- including cost negotiation and on time delivery. Work closely with buyers and technical division to ensure garment design translates to our target customer. Work with buyers on a daily basis about various design decisions, pricing inquiries, and solving issues with delivery and pricing. Create and maintain international quotation sheet- updating ldps, and details as necessary. Negotiating costs with overseas vendors to confirm buyer requested targets and markups are met. Issuing order confirmations to overseas partners once buyers have confirmed price and delivery. Maintain tracking sheets of all confirmed styles fits, pre-production samples, top of production samples, and shipping information. Ensuring pre-production, and top of production samples are sent in with requested corrections made. Tracking company sales performance and best-selling styles to management. Research current market trends and discuss with management and buying team. Summary : 9 Years of professional experience include: 7 + years experience in CRM, Completed 4 full cycle of enhancements/bugs for CRM software, Time and Labor and project module implementation across the policy/investments and financial industries. 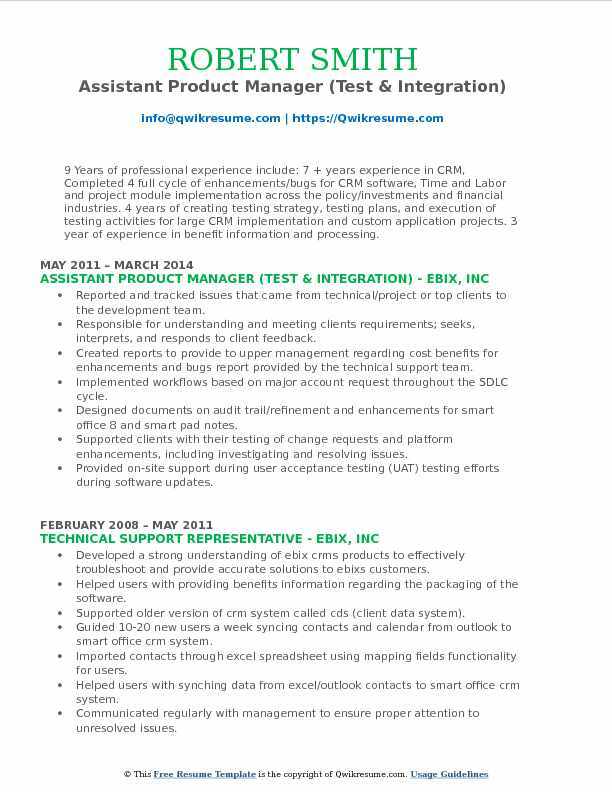 4 years of creating testing strategy, testing plans, and execution of testing activities for large CRM implementation and custom application projects. 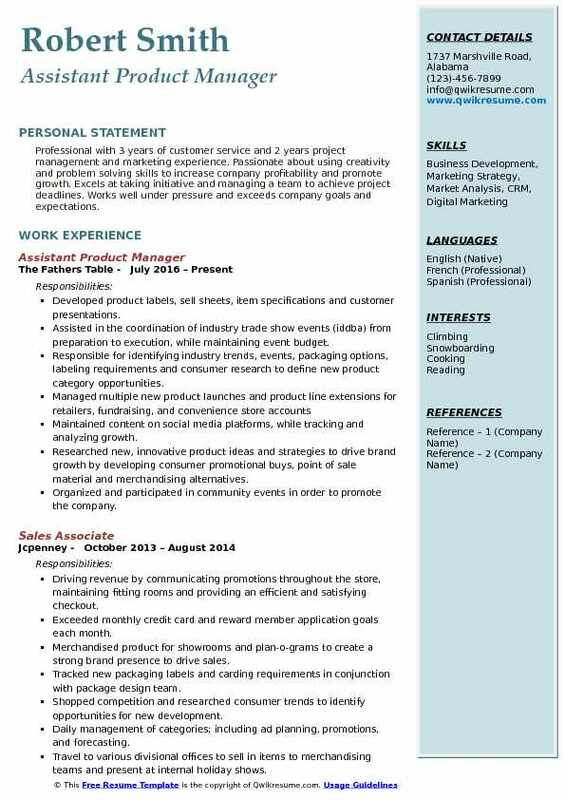 3 year of experience in benefit information and processing. Skills : Customer Service , CRM System and Installation, SmartOffice, Software/purchasing licenses, Testing Strategy, Testing Plans and Execution, SDLC cycle, Translate non-technical business requirements to technical requirements. Reported and tracked issues that came from technical/project or top clients to the development team. Responsible for understanding and meeting clients requirements; seeks, interprets, and responds to client feedback. Created reports to provide to upper management regarding cost benefits for enhancements and bugs report provided by the technical support team. Implemented workflows based on major account request throughout the SDLC cycle. Designed documents on audit trail/refinement and enhancements for smart office 8 and smart pad notes. Supported clients with their testing of change requests and platform enhancements, including investigating and resolving issues. Provided on-site support during user acceptance testing (UAT) testing efforts during software updates. Provided regular status reports to major accounts and to any customer that had open unresolved issues or questions. Coordinated with different teams involved in the project, across countries and time zones to develop the project requirements. Trained clients on use of system and other services and assisted with developing training materials. 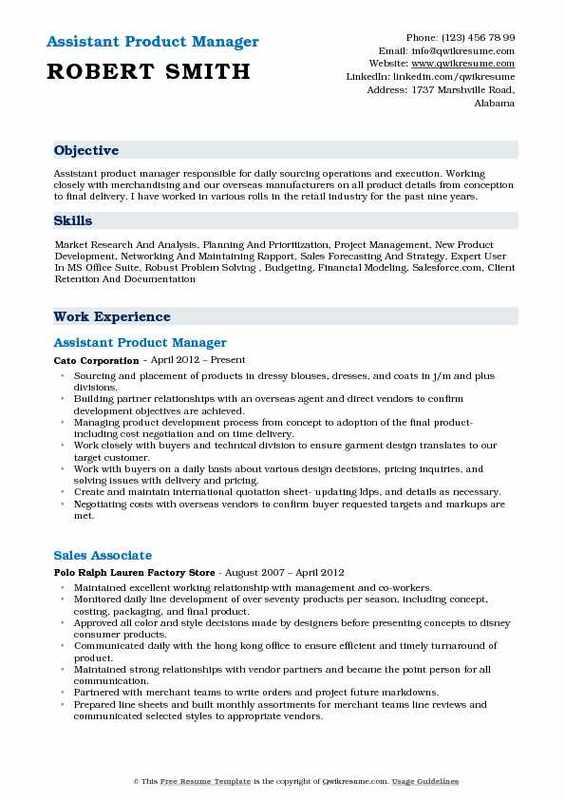 Objective : Assistant Product Manager with 4+ years in Healthcare domain with professional experience in Product & Brand Management and Advertising. Developed the marketing and communication strategy, monitored competition and market. Coordinated within the organization to developing marketing campaigns within budgets. Managed and trained a sales team through launch, implementation, and review of strategies. Facilitated the approval of marketing communication in adherence to established sop. Ensured marketing activities were in compliance with regulatory and legal requirements. Cultivated marketing and brand plan for both new and existing products to define the brand roadmap and monitored its effectiveness by analyzing the market data. Engaged in one of the first national drug safety programs represented the company in seoul, south korea on a global platform. Headline : 5 years of work experience in product and brand management of pharmaceuticals and healthcare products and effectively launching new products in the well grown competitive market. Proven strength in leadership performance, designing marketing strategies and tools based project planning and execution. Skills : Marketing and Product Management, Supply Chain Management, Business Analytics and Competitive Intelligence, Project Management, Written And Oral Communication. Managed core brands of the division to attain top and bottom line profitability. Revived the antibiotic portfolio of the company by successfully launching a brand which ultimately became the top brand in the segment. Designed the positioning strategy overall marketing strategy to increase the market share of the brand by 23%. Played a key role in enhancing market share of newly launched brand by executing product feasibility and gap analysis. Carried out project planning with help of various tools like capital budgeting, npv, irr and implementation through sap/erp system. Improved impacted processes through detailed data analysis with intent to understand market dynamics, customer needs and enhance brand awareness. Experienced handling ims database. Designed creative communication and special demonstration aids (visual aids) for the portfolio brands. Led over 30 product briefings and sales meetings to implement strategy effectively, increasing sales by 9%. 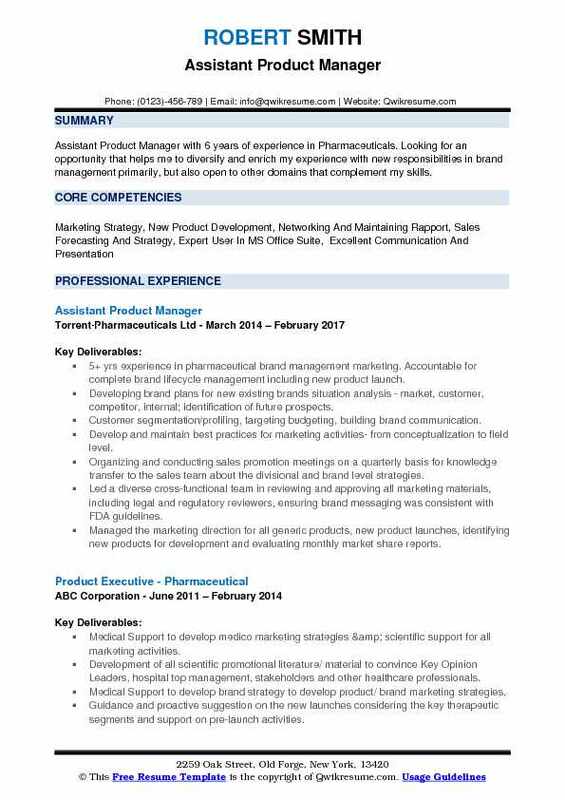 Summary : Accomplished professional with eight years of experience in operations, external sales, brand management, and product management. Seeking a product manager, brand manager, national account manager, or sales manager role in a growth oriented global company that utilizes my skills and experience. Responsible for analyzing and executing marketing programs for Minwax clear products nationally. Worked with a leading agency to create integrated marketing campaigns annually. Managed clear polyurethane products with sales exceeding $111m annually. Accountable for product development timelines, meeting deadlines, and communicating with cross-functional teams both internally and externally. Communicate with and coordinates projects between rd, marketing, channel marketing, sales and senior product manager. Managed consumer promotions budget and communicates with distributors and retailers to promote brand awareness. Managed point-of-sale budget and communicates with vendors and retailers to increase sales through the use of marketing collateral. Created presentations, training material, and sales scripts for sales teams to use with buyers and also end users.